Looking for a little Pre-Halloween fun with your little monsters? Then be sure to visit the Fun Warehouse on Thursday, October 29th between 5:30pm and 8:00pm. 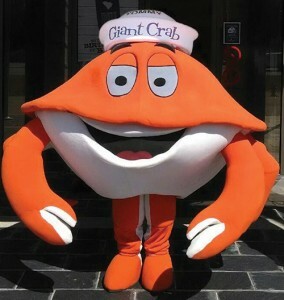 The Giant Crab’s very own Tommy the Crab will be there handing out Halloween goodies to all the little trick or treaters who attend. This annual event features other local businesses as well, all there to pass out treats to kids in their Halloween costumes. They will also have a bounce house, stilt walker and live performances inside. This is a family friendly event and there is no charge, so come on out and say HI to Tommy!